This is a sponsored post written by me on behalf of Hurst Beans. 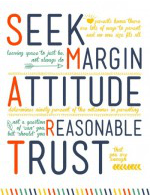 All opinions are 100% mine. One of my favorite quotes from the book Anne of Green Gables, is when Anne says, “I’m so glad I live in a world where there are Octobers.” I couldn’t agree more as I have always loved everything about fall from the crisp weather to the beautiful colors. Living in Florida, I don’t get the whole experience the way I did growing up in the midwest, but one way I can at least pretend that fall has arrived is with fall inspired food such as soup. One of my favorite recipes is for 15 bean soup. The vibrant and rich colors of the different beans reminds me of the leaves changing on the trees, and its savory aroma and hearty flavors make it a perfect hot meal to warm the family up on a chilly day in October or any other month of the year for that matter. I often use dry beans for my soups as I just feel you get a more authentic taste and it really isn’t all that much more trouble. 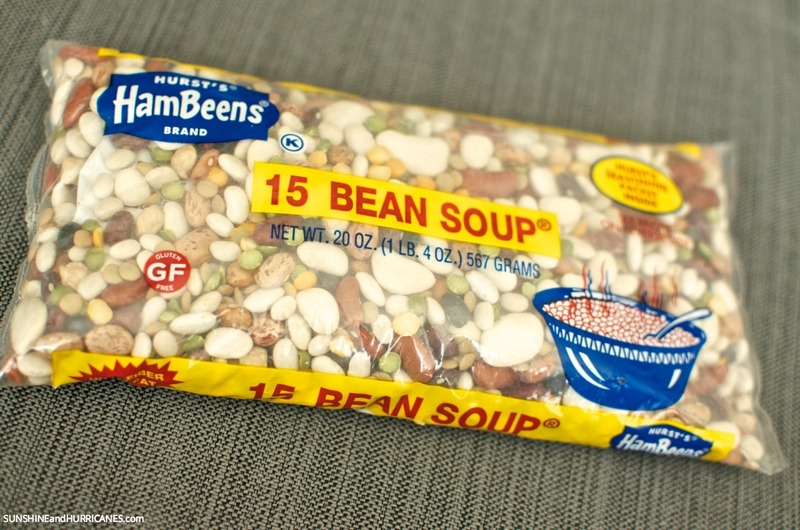 Try a brand like Hurst Beans 15 Bean Soup. You do soak the beans over night, but I just do it in the same pot I’ll be making the soup and it’s worth the extra five minutes the night before to get the richer flavor. Simply rinse the beans and discard any debris, then place in the pot with 8 cups of water and soak overnight (at least 8 hours). I had to take a picture of mine after they were done soaking, because the colors were so striking. Who knew beans could be so beautiful? 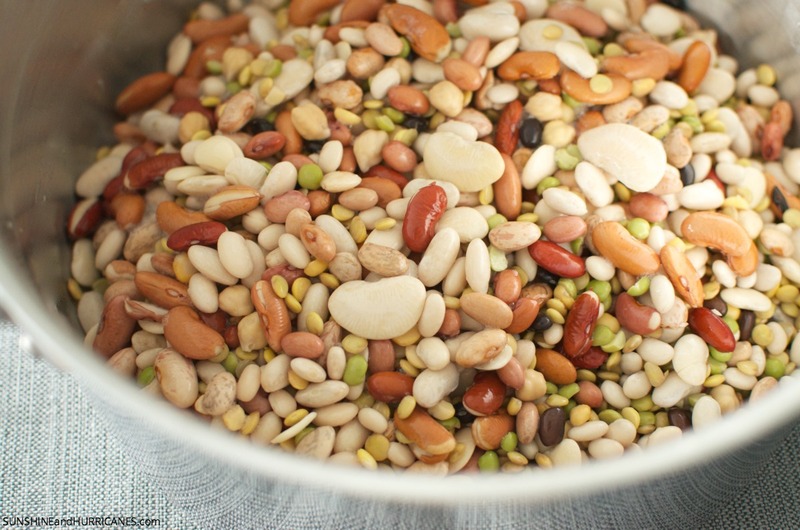 Once the beans are ready, go ahead and gather up the few ingredients you’ll need to get your 15 bean soup cooking. You have a choice of creating a vegetarian version or adding some ham and sausage. Drain the water the beans were soaking in over night and add 8 cups of fresh water along with the onion and meat (if using). Bring to a boil and then reduce the heat and simmer covered for 1 1/2 to 2 hours, stirring occasionally. Next add the tomatoes, the chili powder, lemon juice and garlic and simmer covered for another 30 minutes. There is a seasoning packet included with the beans, you’ll want to add that one to two minutes before your cooking is complete. Salt and pepper to taste and you are ready to serve. It goes great with a crusty baguette or corn bread. For our family of four, this recipe actually makes enough for two meals. I love that, because I can either freeze the leftovers for a quick meal another night or I use it for school lunches during the week. It’s great to do only do the work once for multiple meal options. Drain the water the beans were soaking in over night and add 8 cups of fresh water along with the onion and meat (if using). Bring to a boil and then reduce the heat and simmer covered for 1½ to 2 hours, stirring occasionally. Next add the tomatoes, the chili powder, lemon juice and garlic and simmer covered for another 30 minutes. There is a seasoning packet included with the beans, you'll want to add that one to two minutes before your cooking is complete. 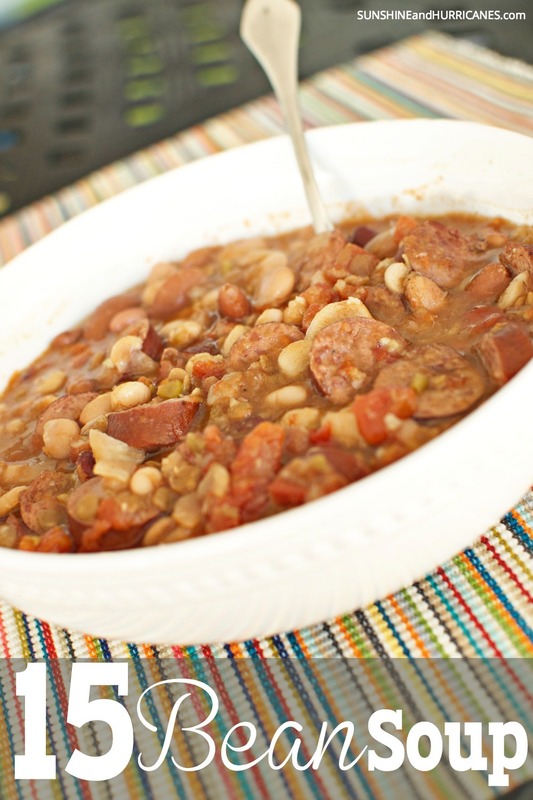 For those who love their slow cookers, you can find the crockpot version of this 15 bean soup recipe at Hurst Beans website. 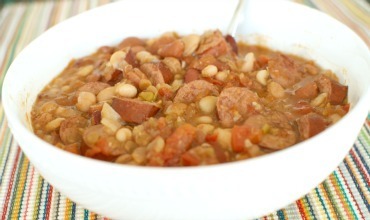 Looking for other great comfort food recipes like our 15 bean soup? Follow Sunshine and Hurricanes ‘s board Satisfying Soups & Stews on Pinterest. I have made this soup many times, sometimes using the seasoning packet most of the time without! It is so delicious! I am going to use smoked sausage this time which I have never done before and thank you for suggesting it. I prefer to brown the sausage first and drain. It adds to the flavor and gets rid of some of the fats. Also a few cans of chicken broth makes this soup a bit more flavorful. 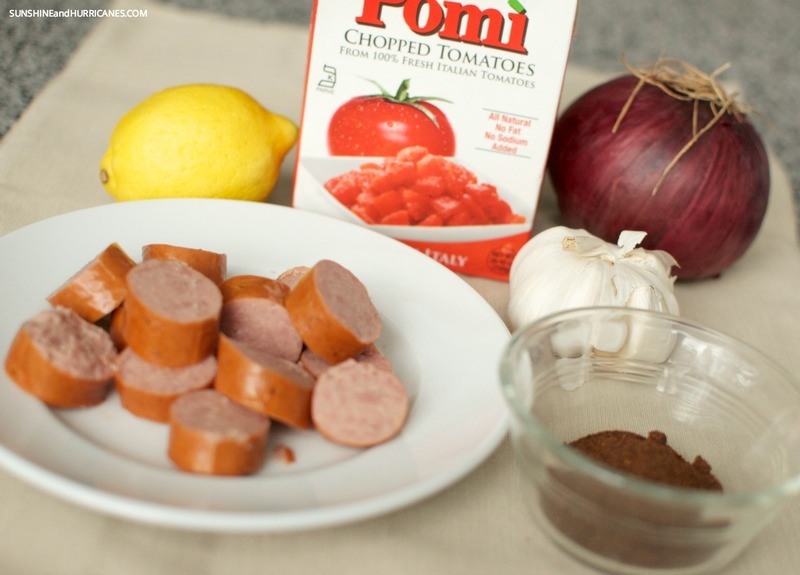 Quick question…Can I substitute chicken for the ham/sausage? I’m sure that you could. But I would probably cook the chicken first. You will have to check on Hurst’s website for specific ingredients for all their products. Thanks! 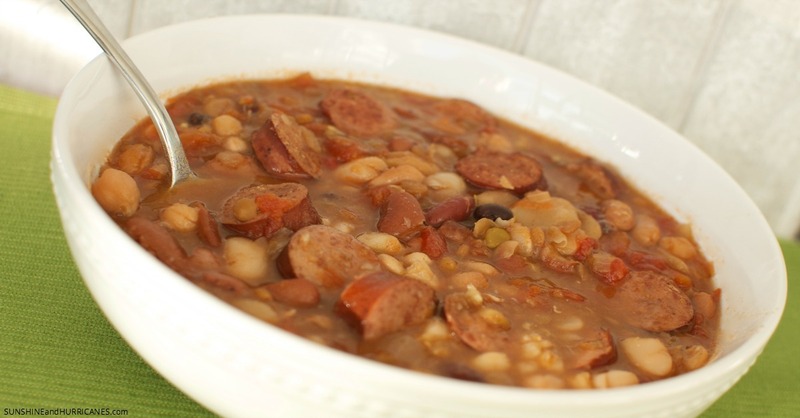 Thank you for your recipe for traditional 15 bean soup! I do have a question. Many sources say that kidney beans must be cooked for at least 10 minutes before adding to recipes as they are toxic otherwise. I’m wondering, then, how is this handled in a multi-bean soup where they obviously can’t be picked out and pre-cooked! 🙂 I have written to the Hurst company but not received an answer. I’ll be honest, I’ve never heard this before.I’ve been using kidney beans in soups and chilis forever and never had any issues or seen anything that gave such instructions. I’m sure if this was truly a health concern there would be warning labels or the instructions would incorporate a step to address this in the recipe. If you’re really worried, I encourage you to follow-up with them again.